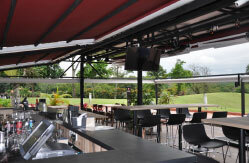 Set amidst lush greenery at the fringe of the golf course in an outdoor environment, the T Bar is now up and running, and definitely something to look out for! Located at the Main Clubhouse just behind the Pro Shop, the T Bar offers a lovely view of the 18th green. The alfresco outlet is provided with an awning which can be fully extended or retracted from both sides of a central canopy, thereby offering protection when it rains or otherwise, wining and relaxing under the exposed moon lit sky. A polycarbonate trellis serves as a sheltered walkway from the Clubhouse to the outlet. The bar counter, tables, chairs and bar stools, all finished in rustic-looking laminate together with a timber deck floor results in the bar blending naturally into the ambience of the surroundings. Equipped with a darts machine and mini putting green, it will be a great relaxation corner for members to unwind with old friends and make new ones while nibbling on finger food and enjoying some drinks. For the beer drinkers, there is nothing better than grabbing a beer and shooting the breeze with a bunch of buddies while soaking in the beautiful view of the sun setting over the golf course. You can also look forward to enjoying live band performances, regular beer & liquor promotions and semi barbecue buffets at this outlet. Looking for a venue to hold your function? The T Bar is certainly one you could consider. Grab your friends now and pop by the T Bar for a drink or two!